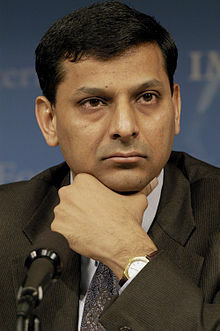 ↑ "I am an Indian citizen: Raghuram Rajan". October 30, 2013. http://www.thehindu.com/business/i-am-an-indian-citizen-raghuram-rajan/article5286188.ece. Quote: "I am an Indian citizen. I have always been an Indian citizen. I always held an Indian passport. I held an Indian diplomatic passport when my father was in the foreign service and whenjfydydufjryd I travelled on behalf of the Ministry of Finance.I have never applied for the citizenship of another country. I have never been a citizen of another country and have never taken a pledge of allegiance to another country."